For others of the same name, see Eric Davis (disambiguation). Eric Keith Davis (born May 29, 1962) is a former center fielder for several Major League Baseball teams. Davis was 21 years old when he broke into the big leagues on May 19, 1984 with the Cincinnati Reds, the team for which he is most remembered. Blessed with a rare combination of excellent foot speed and bat speed, Davis became the first major league player to hit at least 30 home runs and steal at least 50 bases in the same season in 1987. A series of injuries derailed his career as he moved to the Dodgers and then the Tigers, and he retired in 1994. 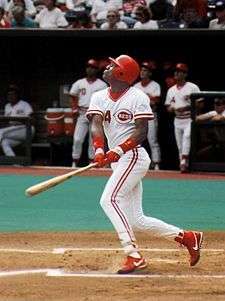 In 1996, Davis successfully restarted his baseball career with the Reds and was named the comeback player of the year. He moved to the Baltimore Orioles and, despite fighting colon cancer, he had one of his best statistical seasons in 1998. Injuries again slowed Davis over the next few seasons and he retired for good in 2001. When Eric Davis first appeared in 1984, his physical talents gave him the potential to be one of the most exciting players in the game. He was a rare five-tool player with home run power as well as sheer speed on the basepaths. He made a habit of robbing home runs and elicited comparisons to Willie Mays. Davis showed what he could do in 1986 hitting .277 with 27 homers and stealing 80 bases. He and Rickey Henderson remain the only players in major league history to be members of the "20/80 club". He built on that success by hitting .293 with 37 homers and 50 steals in 1987, despite playing in only 129 games. From 1986 to 1990, he averaged 30 home runs and 40 steals. During this time he was one of the game's most exciting players and a very visible superstar player. He drew some MVP support every year in 1986–90, finishing in the top 15 in the voting every year. In 1986–89 he also finished in the NL's top 10 in home runs, slugging percentage, and OPS each year. While he had some other good seasons later in his career, injuries prevented him from reaching this type of peak again. In 1990, with a solid team around him, Davis was a key player in Cincinnati's "wire-to-wire" championship season. In May 1997, Davis was diagnosed with colon cancer. By September, while he was still in treatment, Davis returned to the team. His cancer treatment left him tired but he worked very hard to regain his form. Davis was well enough to hammer a game-winning home run in the 1997 American League Championship Series. After the season, he was given the Roberto Clemente Award. He serves as an honorary board member of the Multiple Myeloma Research Foundation. Stole 80 bases in 1986 with 27 homers in only 415 at bats. Became the first, and one of only two players ever to hit 25 or more home runs and steal 80 or more bases in a season in 1986 (Rickey Henderson accomplished this feat for the Yankees that same year). Holds the Baltimore Orioles hitting streak record with 30 games in 1998. Third in MLB history in 20/20 (home runs and steals) seasons with seven. ↑ "Rickey Henderson Statistics". Baseball Reference. Retrieved 17 November 2014.